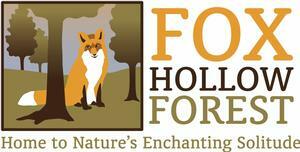 Fox Hollow Forest is a one hundered-plus acre forested rural property located amidst the scenic rolling hills of the Missouri River corridor in southern Boone County, Missouri, west of Ashland. This peaceful, heavily timbered landscape rests ten minutes from Ashland, five minutes from the Missouri River and the trans-Missouri recreational KatyTrail, and half way between the two central Missouri metropolitan areas of Columbia and Jefferson City,﻿ Missouri's state capitol city. Fox Hollow Forest enjoys rural solitude with convenient access to nearby commerce, medical and cultural regional centers. Owned and managed by Fox Hollow Forest LLC, this rural property is utilized by the owners and their guests to seek solitude from everyday urban life. Besides enjoying rest and relaxation, the owners pursue conservation practices to mitigate the on-going pressures of plant invasion by such non-native exotics as bush honeysuckle, multiflora rose, autumn olive, and Johnson grass as well as aggresive natives including thorny honeylocust and eastern red cedar. Soon after the purchase of the property in the mid-1990's, the owners concentrated their efforts to clean up the significant junk and debris left behind by the previous property owner. The early 2000's realized a complete renovation of the traditional farmhouse known as The Farmhouse at Fox Hollow. The revived farmhouse provides a cozy "base camp" for enjoyment by the owners and their guests. Fox Hollow is blessed with a watershed free of urban impacts. 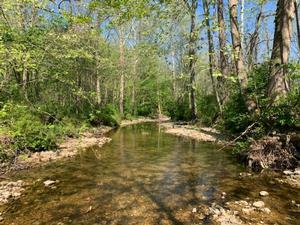 To view the Fox Hollow Branch in relation to the Bonne Femme Subwatershed, GO HERE. Fox Hollow Creek at the low water crossing entrance to Fox Hollow Forest. Fox Hollow Forest - That was then . . . This is NOW! An illustrated history - 1994 to present.